Getting my nails done is the one thing that I look forward to every couple of weeks, not feeling is better than just sitting for about an hour and doing nothing. I love going to the salon but at this time of year its as struggle, I am constantly wanting to change the colour of them. A girl gets bored you know! 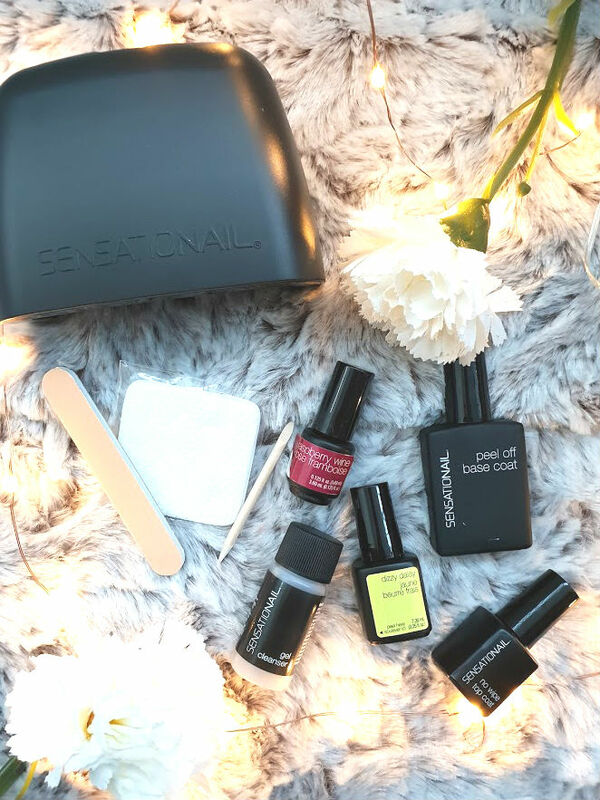 Since discovering the Sensationail Peel Off Kit* my life has been changed for the better and my nail lady will never know! 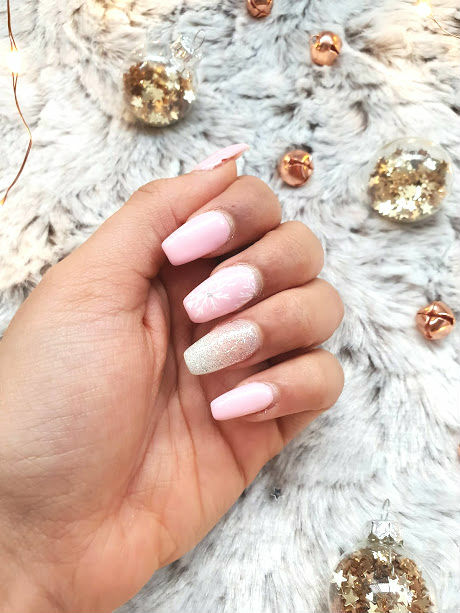 These were my original set by the professionals, a pink nail polish with silver glitter on one and nail art on the another. I loved this set for the first two weeks but then I wanted something new and more festive. These were more of an introduction to the season. It was pretty easy to remove the colour, just a swipe of a non-acetone remover to avoid the acrylic nail to pop off. After this it was time to give them a bit of file and tidy using the nail buffer in the set. As I did all of this, using the cleanser was an extra important step because it prepared the nail for what was to come. Then the next few steps were so much easier to do then I thought, my nail application is always messy but having everything infront of me was a lot easier. On the nails it was a quick application of the base coat, this is the magical bit. This base coat is what enables the polish on top peel off with ease, it was important to let this air dry and not cure in the lamp - noted this after doing it once by accident on my toes. After, I went in with a layer of the colour and then curing it in the lamp. The UV light in these lamps are what set the polish and give it that longevity that gels give. I repeated this 3 times, which is once more than recommended but on the white acrylic it took a bit of going for the shade to show. After building the colour up, it was time for the top coat. This is also another important part of the gel nail application as it the top part of the sandwich. I've learnt the hard way that this needs to cure correctly and without being smudged or moved whilst in the lamp - otherwise its all a disaster. Then you have some gorgeous looking nails that can be peeled away after 48 hours. 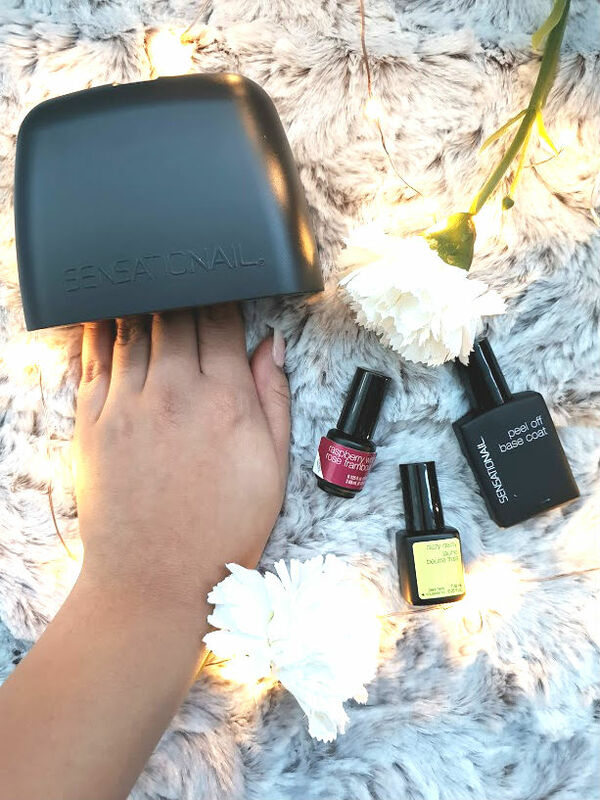 This means if you have a special occasion that you need nails for, or just want them for a short time then this kit is for you! I've peeled and tried both fingers and toes, but have no photo evidence (sorry) but it was as simple as peeling away normal nail polish on the nail. 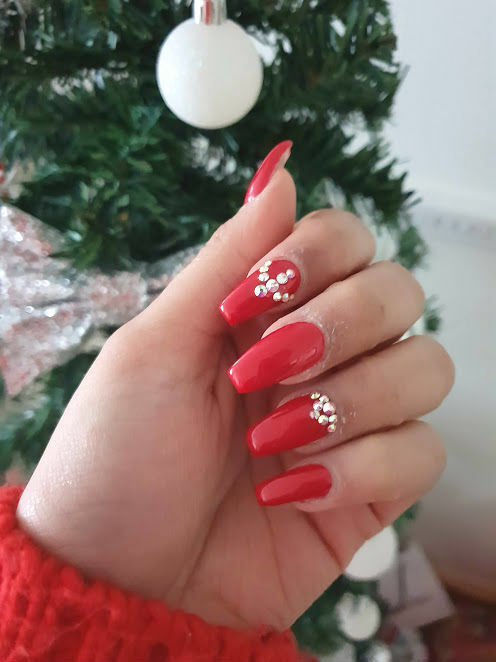 I added a couple/ a lot of gems to my nails to make them look even more festive because it is Christmas after all. I also don't understand why they appear more red on the screen when in real life they are very much a raspberry shade... who knows!